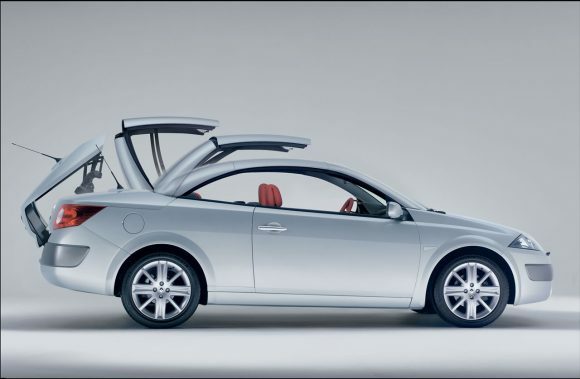 The Renault Megane Coupe-Cabriolet was one of the first modern convertibles with a folding hard roof to be developed and is still one of the most successful. 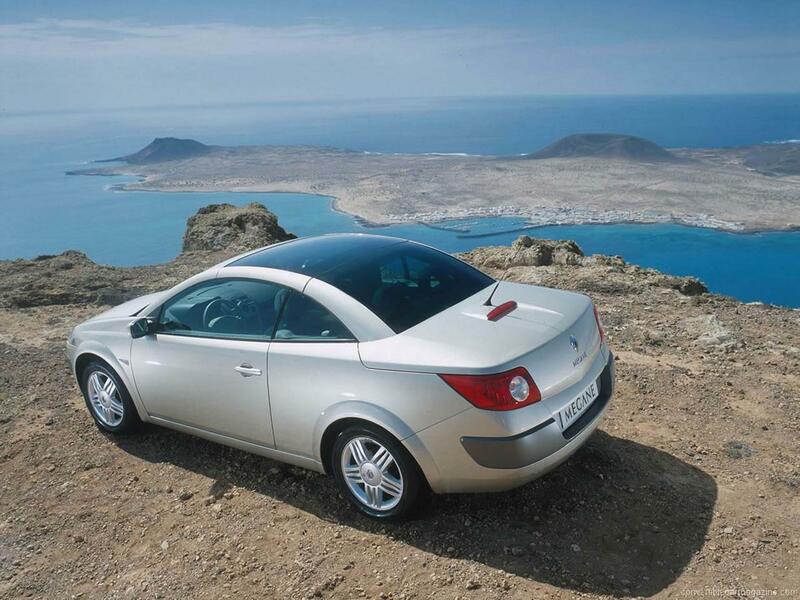 All of the Megane range has unusual styling and the CC is arguably the most attractive. The result is a stylish yet understated car. The folding roof works effortlessly and has a problem free reputation although it has been known to suffer leaks. 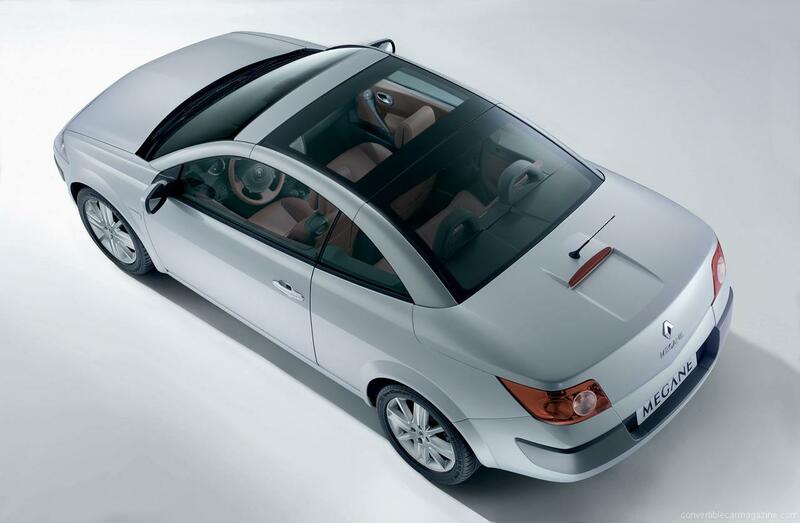 A lighter weight means that it offers more spritely performance and better fuel economy than its Peugeot 307CC rival. All engines are sufficient, but the 2 litre turbo is the only one that could be described as sporting. 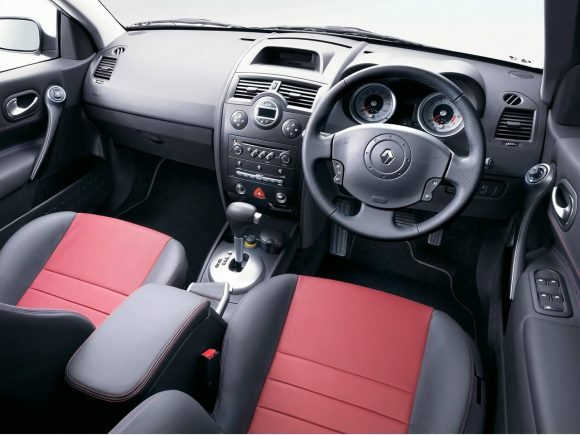 The entry level Renault Megane 1.6 VVT Coupe-Cabriolet has a four cylinder petrol engine that suits it well. Performance is steady but not slow and the ride is compliant and smooth. The electric power steering lacks driver feedback but makes the car easy to manoeuvre around town. In the middle of the range, the Renault Megane Coupe-Cabriolet with an eager 2 litre petrol engine is enjoyable to drive without being too thirsty. While the supple suspension makes this car less sporty it isn't a disappointment, remaining a pleasure to drive and surprisingly capable. With a low-pressure turbo which goes almost undetected while driving, the Renault Megane 2.0 Turbo Coupe-Cabriolet is rapid transportation with all the gallic charm of the convertible Megane. The fastest car in the range does not get the firm Renaultsport suspension allowing the chassis to smoothly soak up bumps in the road. The result is a car that is swift to drive but remains comfortable over long distances. 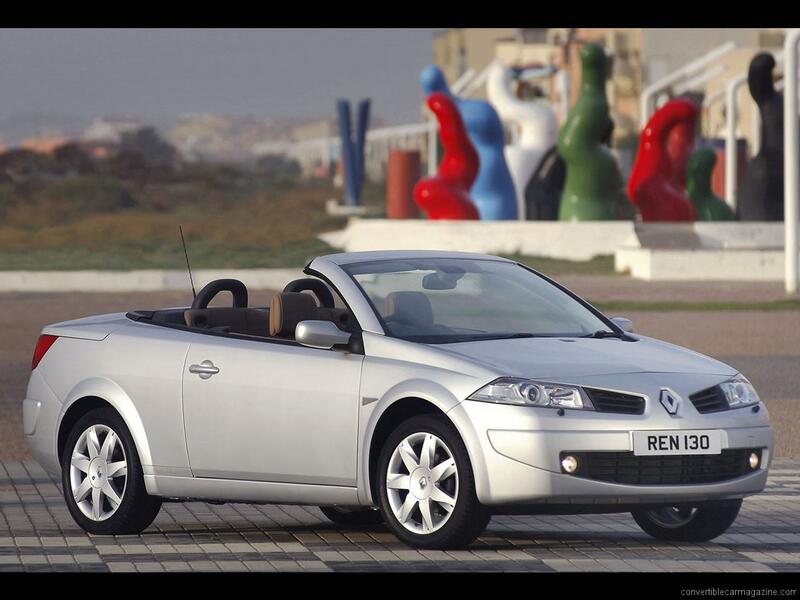 Renault Megane 1.5 dCi 106 Coupe-Cabriolet is a popular option thanks to the fuel efficient, low emissions engine. Performance isn't really its strong point but it doesn't disgrace itself. Cruising along at a reasonable speed with the roof down it runs smoothly and quietly but at low speeds it can be a bit noisy. With the middle child of the three diesel engines offered, the Renault Megane 1.9 dCi 130 Coupe-Cabriolet offers swift performance while being frugal with its fuel. It is pleasant and comfortable to drive and the glass roofed cabin feels a little bit special. Renault saw fit to offer 3 diesel options in the Megane Cabriolet and this is the most powerful. The difference in horsepower had little effect on the car's performance with performance figures almost identical to the 1.9 dCi. Behind the wheel it was a touch more responsive but you had to drive the two back-to-back to notice any difference. 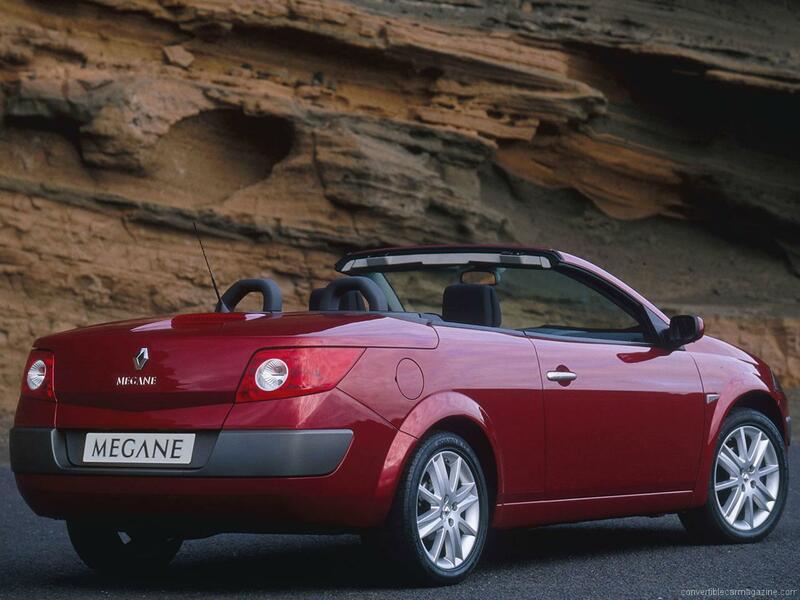 Do you drive a Renault Megane Coupe-Cabriolet? Would you recommend it to others? Join the conversation and let us know what you think of the car. This Renault currently has 9 owner reviews. love the car, beautiful to drive. i have just purchased a 05 1.6 VVT privilege cabriolet, but need a copy of the owners manual to get to know the better, any ideas? have tried to google and have also contacted a Renault dealership. I have the Megane CC 1.5dci 2006 and it’s fab!. enough power for everyday driving and 55mpg. Just fitted a new roof seal (£200) and now it doesnt even leak. Gotta be one of the nicest folding hard tops out there. No, take that back – it still leaks!!! Try cleaning all the seals and make sure all the drainage channels are clear. I have had one for quite some time now, I have done 140 000 miles still going strong. Great little car, auto gear change is a little bit awkward in reverse torque (downhill) meaning use of the tiptronic option is more than occasional. Fuel consumption actually not quite as low as advertised. However, very comfortable and fun to drive, exceptionally quiet at speed as well. I would say that the gear ratios are set a bit low (meaning revolutions are a bit higher than strictly necessary) but again the tiptronic overcomes this when necessary except of course in top gear. My ancient vauxhall 2 litre (ESTATE CAR) rated at only 90 bhp would do 120 Kph at abt 2,800 rpm whereas this one is at 3,300 rpm at this speeed and is rated 136hp. It also of course used somewhat less fuel but equally of course had far poorer acceleration. VERY slight water leak betwen the roof and main side window in car wash but none in real rain. I have only just picked up a Megane CC 2004 2.0VVT, and delighted with its enthusiastic cheerful feel. It is a relaxed cruiser, with no particular qualities to applaud. Yet it is a charmingly enjoyable car to drive. The gear shift is a little vague, and would benefit from a heavier hand piece. Gears close, and given the closeness a seventh and eighth would be welcome. K&N filters and kit together with an improved exhaust would be useful as would stiffer suspension settings. Easy to like and get along with, nothing to hate but difficult to fall in love with,.